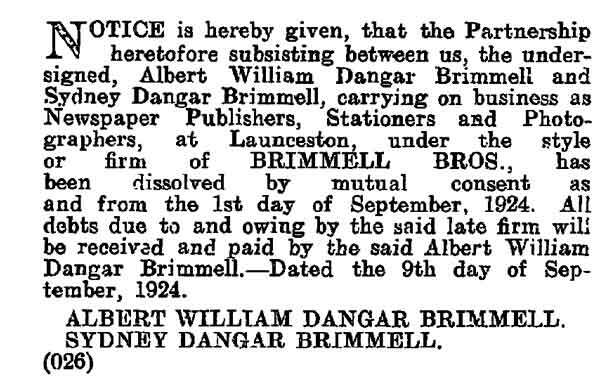 The bio of Sydney Dangar Brimmell | Launceston Then! Sydney was born in 1877 to John and Elizabeth Brimmell at 11, Church Street, Launceston. His father was a printer and newspaper proprietor, publishing the ‘Launceston Weekly News.’ On leaving school, Sydney joined his fathers business soon becoming a well regarded journalist. On his fathers death in 1899, along with his brother William, he took over the running of the paper and business renaming it as ‘Brimmell Bros’ Newspaper Publishers, Stationers and Photographers. After the paper had been had been absorbed by ‘The Cornish and Devon,’ Sydney moved to Bodmin to take up a position with ‘The Bodmin Guardian.’ Whilst living at Bodmin, his wife, Kathleen passed away, and Sydney himself began to suffer from ill health. This led to him moving back to Launceston in January 1944 to live at ‘Treglasta’, Western Road, Launceston with his daughter, now Barbara Freethy. 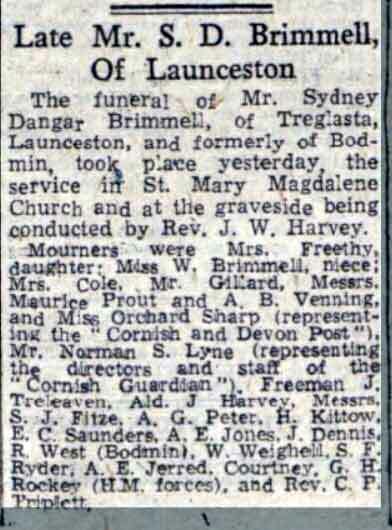 He found employment with ‘the Cornish and Devon Post.’ This however, was cut short, as Sydney’s continued poor health ultimately led to his death in the February of 1944. His funeral was held at St. Mary Magdalene Church on March 1st, 1944.